Such rhetorical gestures have an undeniable resonance with Suh’s peripatetic and globalized personal history. (The South Korean-born artist was educated first in Seoul and later in the US. He now splits his time among New York City, London, and Seoul.) But they also rely heavily on the semiotic play between clear stylistic markers-the stately red brick and Georgian moldings of Suh's American apartment pierced by the tile roof and intricately carved timbers of his Korean house-and interpreting Suh's work primarily by reading buildings as signs threatens to overshadow the more subtle engagement with architecture that subtends the works for which he is best known. These are the full-scale fabric re-creations of domestic spaces such as Apartment A, Unit 2, Corridor and Staircase, 348 West 22nd Street, New York, NY 10011, USA, 2011-14, which was the centerpiece of Suh's recent exhibition at the Contemporary in Austin. This work consists of astonishingly detailed renderings of the artist's current and former New York apartments. Because of their exacting faithfulness to the originals, Suh's re-creations are often described as facsimiles, as if they were actual physical copies of the structures they represent. But unlike the many artistic practices that extrapolate from architectural starting points, Suh's work rejects the literal, indexical connection of a shared materiality and instead keeps the building at a distance. 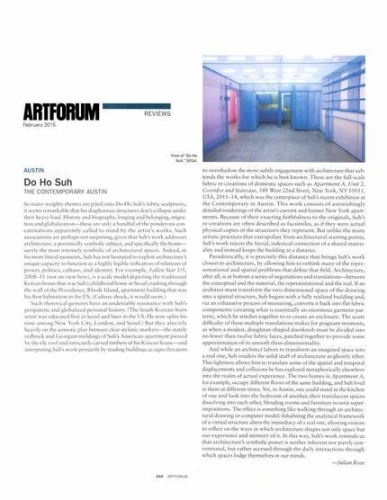 Paradoxically, it is precisely this distance that brings Suh's work closest to architecture, by allowing him to rethink many of the representational and spatial problems that define that field. Architecture, after all, is at bottom a series of negotiations and translations-between the conceptual and the material, the representational and the real. If an architect must transform the two-dimensional space of the drawing into a spatial structure, Suh begins with a fully realized building and, via an exhaustive process of measuring, converts it back into flat fabric components (creating what is essentially an enormous garment pattern), which he stitches together to re-create an enclosure. The acute difficulty of these multiple translations makes for poignant moments, as when a modest, doughnut-shaped doorknob must be divided into no fewer than twelve fabric faces, patched together to provide some approximation of its smooth three-dimensionality. And while an architect labors to transform an imagined space into a real one, Suh renders the solid stuff of architecture as ghostly ether. This lightness allows him to translate some of the spatial and temporal displacements and collisions he has explored metaphorically elsewhere into the realm of actual experience. The two homes in Apartment A, for example, occupy different floors of the same building, and Suh lived in them at different times. Yet, in Austin, one could stand in the kitchen of one and look into the bedroom of another, their translucent spaces dissolving into each other, blending rooms and furniture in eerie superimpositions. The effect is something like walking through an architectural drawing or computer model: Inhabiting the analytical framework of a virtual structure alters the immediacy of a real one, allowing visitors to reflect on the ways in which architecture shapes not only space but our experience and memory of it. In this way, Suh's work reminds us that architecture's symbolic power is neither inherent nor purely conventional, but rather accrued through the daily interactions through which spaces lodge themselves in our minds.